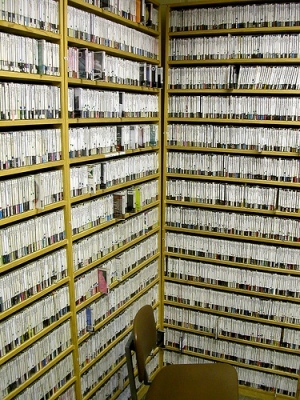 A section of the WLUW music library. Checking our e-mails, the schedules for the WLUW Record Fair had been posted, and both members of the music department had been given time slots to DJ for the crowds at the fair. "I'm a little nervous," said Mike Ardaiolo, the station's music director. "I'm going to be spinning records in front of hundreds of people. I've never done that before." "Mike, you play records for thousands of people every day," I said. He contemplates this for a moment. "Well, yeah, but I don't have to see them." This conversation tells a lot about the staff and activities of WLUW. It is a small organization located on the campus of Loyola University's Lake Shore Campus, but is not owned by them. The staff is composed of two full-time employees, several part-time workers, and over two hundred volunteers (who act as DJs, festival representatives, phone operators, CD reviewers and more). Due to the varying availability of the volunteers, full staff meetings are held only once a month, with e-mail handling the bulk of communication and organization. The volunteers and staff are busy working side jobs, finishing educations, or sometimes both. And yet the culmination of all these side efforts is a radio station that twenty to thirty thousand listeners tune into daily. It's easy to feel modest about daily contributions inside the confines of double-occupied offices or a radio booth littered with action figures and lovingly grafittied posters, but that antenna serves as a nice metaphor — the station sends out growing waves across Chicago. Madeline Kuhns reads a script for a public service announcement. Before this announcement, WLUW had been growing at a steady pace, and was on track to be completely in the black this year. This announcement was leaked at an inopportune time — almost every volunteer at the station was working a shift at the Pitchfork Music Festival, and aside from putting a cloud over the festivities for all of them, it also drew a bevy of reporters to the table, asking questions to which the staff could not give answers. After a meeting held this past Monday night, the details became clearer — the station was expected to change hands in June of 2008, and that the current staff and DJ schedule would remain until that time. Unfortunately, the announcement of this decision opened a loophole that had not been planned for: without an expected future in its current donation-supported format, the current fiscal year could not be supported with pledge drives or fundraiser events ethically. In light of this, Loyola agreed to cover the cost of one full-time employee to manage the station in addition to the senior staff, a WBEZ employee to be revealed officially at a later date. The station's current general manager and program director will help transition the interim director into the position, but will no longer hold their positions. The most obvious aspect of a radio station is the music, and the music department takes pains to leave just the right sonic footprint on its listeners. While the DJs have the freedom to play nearly anything on their shows, the music department asks them to play several tracks from a core of recent releases from labels or artists who fit the sound of WLUW (known as "rotation"). Mike (the aforementioned head music director) commutes two days a week up to the station from Logan Square to manage rotation, reporting our top album charts to promoters and College Music Journal, the Billboard of college and indie radio stations. While there is definitely no money exchanging hands, promoters call and write weekly to know if the artists they represent are getting "spins," and they're not afraid to ask why the station has added certain artists to it's lucrative rotation spots while others simply get put in the library, or passed over entirely. Luckily, Mike was nominated for CMJ's "Least Likely To Sell Out" Award last year, and keeps strong lines of communication with the DJs so that his choices are not entirely subjective. However, Mike's choices seem to be well-received — his music blog Audiversity has received a write-up from the Wall Street Journal, and has led him to receive an invitation to curate a music festival, as well as an offer from Microsoft's Zune marketing group (it was politely turned down). Mike posted his own feelings on the announcement this weekend, and he uses phrases such as "worst possible news" and "an absolute shame" to describe the situation. His sentiments have been echoed through the staff — although there are certainly points of anger, the general understanding is that the situation is not served by any thoughts of vengeance or attacks on the school — but rather to be viewed as a great loss for both the community of volunteers that puts WLUW together for the community of listeners that enjoy hearing it. In addition to his blog, Mike works at Reckless Records — one of several individuals whose daily jobs dovetail nicely with their nightly (or daily) radio alter-egos. The station's live sound engineer has an impeccable pedigree thanks to his full-time job with Shure microphones. DJ Peter Margasak writes about music for the Reader. 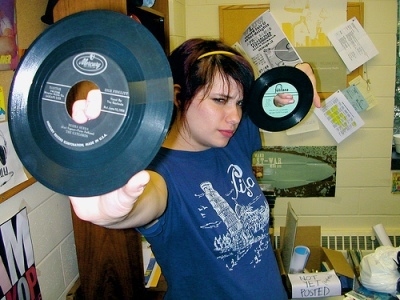 Mary Nisi organizes WLUW's biannual Record Fairs and runs her own event DJ company Toast and Jam. And the head of marketing and promotions has interned at MP Shows, Thrill Jockey and Pitchfork Media — all before her 21st birthday. Mica Alaniz, in addition to this resume, also holds the distinction of being one of the longest-serving senior staff members at WLUW. Her office, (shared with co-director Jason) is stacked high with stickers, buttons, t-shirts and squirt guns. The department is in the middle of its busiest task — making appearances at as many festivals as possible, sometimes working tables at two different locations in the same weekend. Although some revenue is generated by selling t-shirts and live performance compilation CDs, the major purpose of the appearances is to raise awareness of the station. Scheduling volunteers, setting up sponsorship deals and spots at the fairs, and occasionally handing out schwag in person, WLUW is nearly a full-time job for Mica (although she, like Mike, works at Reckless by day). Mica often spends both odd and late hours working at the station, but her love for the station and the kudos from people on the streets keeps her going. "The feedback from people is great," she says. "With the sheer amount of diverse programming on the station, we get to so many different kinds of people who really love this show or that DJ. Even if they only love two hours of programming in the middle of the night, that's their programming, and I don't think it's something a major station can replicate, and it's a level of love they're not going to get." Kristin Marks shows off some donated goods in the Special Events Department. Kristin Marks is sitting in the hall outside the special events office, reusing envelopes from record labels to send out auction items won by bidders in WLUW's e-Bay auction. To her side sits an improvised poster tube, constructed from donated boxes. While the methods are thrifty, the items themselves are nothing to scoff at. "We asked a lot of like-minded organizations and individuals to contribute items, and they were very responsive." The station received signed tour posters, albums, books and strange novelties galore (the cheeseburger-shaped CD wallet was well-received). 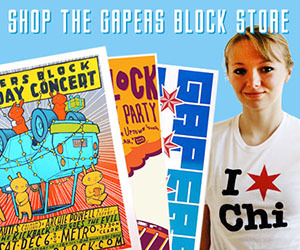 In addition to the e-Bay auction, the department focuses much of its energies on the very popular Record Fair, held once a year inside the Pitchfork Music Festival and once again as a solo event. 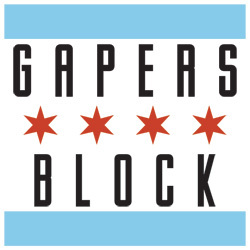 The latter includes its own musical performance schedule, including past performances from local luminaries like Devin Davis, The Black Bear Combo and Canasta. Mary Nisi has helped shepherd the event into WLUW's biggest event fundraiser outside of pledge drives. The process can be a bit draining. "It's like giving birth to a child or three. At once," says Mary. "But when I'm there, it's awesome and I can't believe I get to be a part of this." Mary is one of the longest-serving members of the WLUW staff, and the future of the Record Fair is now uncertain, due to the restrictions on fundraisers. Her vast event experience and loyal roster of vendors are something she has earned, and she faces a question that many others who hold fundraisers for the station must now ask: When the license changes hands, what will be done with the parts of WLUW that do not hinge on the radio broadcast? Jenny Lizak comes to the station every Tuesday night to host the Women on Women music show. In honor of Independence Day, she is playing a theme of independent artists (with a wink and a nudge — it's hardly a stretch with WLUW's library). "So often in the world of indie rock, you miss out on female voices, so several years ago two DJs named Kate and Carly decided to start a show dedicated to female musicians: Women on Women. W.O.W. has been passed on through different hosts for over five years, and we hope to keep it going forever." Jenny is one of many people who got a career step up from the station — in her first run at the station, her time volunteering here helped her land her current position as a publicist at the Metro. For a time, Jenny left the station to fully pursue her job. But after a shift in programming from her days as a Loyola student was matched with an opening on the show she decided to return to her radio roots. "I decided to come back to host W.O.W., but also because I actually wanted to give something back to the station". Jenny has been through some of this before: she was a DJ during the much-harangued beginning of WBEZ's management of the station, and recalled on Monday how the station had ultimately pulled through the transition then and could now. She expressed a viewpoint that was echoed almost universally: the staff, volunteers, and DJs want the station to stay running until the last possible moment. 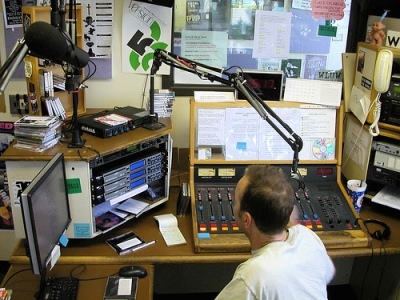 Although feelings may be hurt and two close friends are leaving, there is an opportunity to for the staff to put out one more year of community radio for all the fans they've gathered over the years. Ultimately only our smug egos could be gained from leaving the station in some sort of protest, or to use the station as a forum to attack. As one DJ framed it: we should be grateful that we have this opportunity at all, and we have to make the most of it. And as Jenny has experienced before, perhaps the transition will not be the doomsday scenario we have painted it to be — a look back to media mentions five years ago shows predictions of BEZ completely overhauling the station, using it for a signal relay, and other such currently untrue fears. Although the loss of Craig and Shawn is something without comparison, the station's community has survived before and will hopefully survive again That sentiment is shared by the college, although like all correspondence, has come through the press or WBEZ — as of press time, Loyola has made no effort to meet with the the staff of WLUW. DJ Dave Leoschke in the DJ booth. WLUW's DJs pass from shift to shift, late-night hosts giving way to newer DJs braving the 2-4 and 4-6am shifts, and eventually coming around to the morning show hosts. The station's volunteers and employees hop in and out of offices, joking in the hallway and occasionally sitting down in the booth to play two hours of their own musical fancy. Occasionally another DJ will peer over their shoulder, examining their play list to either playfully rib the DJ or nod approval at their selections. Even if it's easy for them to forget that there are thousands of others making that same judgment call, plenty of those people seem be nodding too. The loss of the station is somewhat unbearable in my mind, as is the thought that the school could do anything nearly as far-reaching as the current staff and volunteers have achieved. While the school will obviously choose to look out for its own interests, one can only hope that they realize the opportunity they are passing on — to host the largest community-sponsored independent radio station in the third-largest market in the country, and to allow its students to work with an organization that for all intensive purposes is the greatest free internship program they could ask for. The resources, connections, and established radio roots of WLUW should not be tossed aside in the name of complete student autonomy — the learning experiences they can have working with WLUW now are plentiful. In addition, the staff members of the station are obviously only individuals — even a week without General Manager Craig Kois ended without the station erupting in flames. But to lose the organizational efforts, work ethic, and shared understanding of the processes of a radio station that this staff possesses would effectively send the station back to infancy — an unnecessary and community-damaging reversion that Loyola could avoid by compromising with the current organization. In Loyola's press statement, they state that "the community radio station label is akin to calling another station blues, jazz, or rock. It's a format, not ownership." 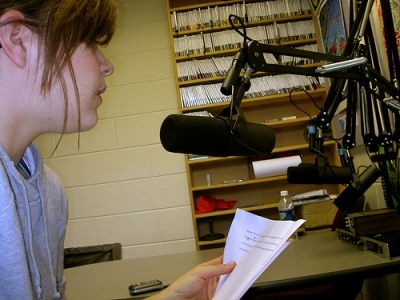 When Loyola chose to cease all funding for the station five years ago, they were pleased to cede control to an organization that has allowed the station to meet its operating expenses while still serving the community and offering opportunities to students in every aspect of the station's daily functions (including management). If the school is truly committed to its ideas of social justice and community, they might consider the possibility that they are making a mistake that will leave lasting and unnecessary ill will — and that community is something far greater than just a format. With strangely prescient timing, a bill has been brought before congress that would allow for low-power FM stations to apply for openings in the broadcast spectrum. This bill holds great promise for independent radio across the nation, and has been strongly endorsed by the current staff of WLUW. If you wish to show your support for WLUW, community radio, or independent media in general — signing this petition to open up the airwaves would be a great start.